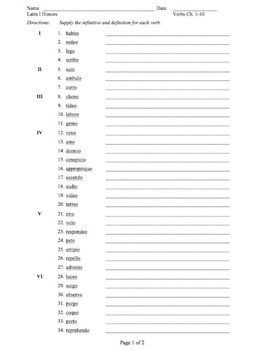 Since Ecce Romani introduces verb conjugation in Chapter 10 and begins listing verbs in the chapter vocabulary with the 2nd principal part in Chapter 11, that makes the time between Chapters 10 and 11 a great time to summarize previous verb vocabulary and add the infinitives. 1) All 68 verbs listed by chapter for Chapters 1-10. 2) Fit onto two pages so it can be printed on one 8.5x11 sheet, back and front.